St. Augustine to or from Jacksonville Airport. Other transportation available by quote. 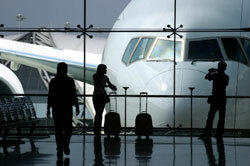 The Shuttle Service or Door to Door Service can be combined in a round trip booking. We require a 24 hour notice with no charge. If you cancel within a 12 hour time frame before your reservation, there will be a $20.00 cancel fee. Within 3 hours, you will be charged your full fare. The only exception is if the airline has canceled your flight, but we have to verify that to issue full refund. St. Augustine, St. Augustine Beach, Crescent Beach, Marineland, The Hammock, Ponte Vedra, Vilano, Palm Valley, Palencia, Kensington, World Golf Village, 210 Area, Bartram Springs, Palm Coast, Bunnell, Elkton, Hastings, Palatka, The Avenues and more. Transporting to or from Airports, (Jacksonville, St. Augustine, Daytona), Cruise lines (Jacksonville), Amtrak, (Jacksonville or Palatka), Greyhound, Hospitals, Amusement Parks, Hotels, B & B’s, and other special requests by quote. Executive and group rates available. Jacksonville Airport pick up. We meet you at Prearranged Transportation outside of baggage claim "1". This is at far left as you are coming down the escalator. You will check in outside, at the "Ground Transportation" booth so the attendant will call us to the curb to pick you up. For departing passengers, we drop you at your airline terminal, curbside. Walk down the only escalator to Baggage claim, turn left off escalator, walk to the end of baggage claim "1" , walking past the obvious sliding doors on right to the obscure sliding glass doors at very end at right. Walk outside to Prearranged Transportation. Check in with the Ground transportation booth so the attendant will call your driver to the curb. Vans marked Airport Shuttle of St. Augustine, Inc. We have a Palm tree logo. If you walk out main exit of baggage claim, you may walk to your left to the end, side of the building to find Prearranged Transportation. You must check in with “Ground Transportation”, an enclosed booth outside on the side walk. They will call us from the hold parking there to the curb to pick you up. All other Airports we meet you outside of your airline baggage claim, curbside. For departing, we drop you at your departing airline terminal, curbside. Disclaimer: Prices may be subjected to a additional gas surcharge.